By Tony and Suzanne Bamonte, excerpted from their book, Manito Park: A Reflection of Spokane’s Past. Find more of the Bamonte’s books at Tornado Creek Publications. Pictured above, Francis and Laura Cook’s nine-bedroom home, which was completed by April 1892 and lost in 1897 following the economic panic of 1893. The home was located at the site of the present Cathedral of St. John’s parish house, the Jewett House. 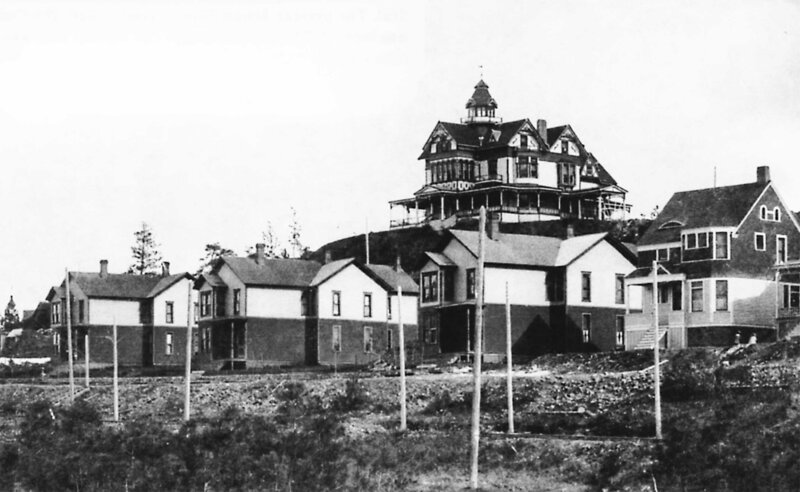 Around 1901, it was converted into Mount View (later Spokane) Sanatarium. The new Spokane & Montrose Motor Railroad ran on the road in front of the smaller houses. Photo courtesy of Tony and Suzanne Bamonte, via Adi Song, Cooks’ great-granddaughter. In 1887, Cook’s farm on the South Hill would undergo a drastic transition, greatly influencing the development of the Manito Park area. In July 1887, a lawyer by the name of T.J. Dooley arrived from Minnesota, where he had been engaged in real estate development. Shortly after his arrival, he became excited by the potential of Spokane Falls, especially about Cook’s property and its proximity to the town. Two of the biggest attractions of the plateau were its lofty location with an expansive view and, because of its being outside the city limits, its exemption from city taxes. Dooley acted quickly and on the 19th of November 1887, he and Cook formed a land development partnership (Northwestern Land Company). Under the terms of this agreement, Dooley agreed to procure a franchise and funding for construction of a motorized streetcar line from downtown to Cook’s property, which Cook would build and operate. Dooley would also plat Cook’s land into a subdivision of residential lots, creating the Montrose Park Addition. It was to include streets, alleys, boulevards (namely Grand and Manito) and parks. In exchange for Dooley’s efforts, Cook agreed to give him sole control over the sale of these lots, with Dooley receiving up to 20% for each lot sold. This contract was to extend for a period of three years. Cook’s Spokane & Montrose line initially consisted of a square-shaped engine and two passenger coaches. The route began between Front (now Spokane Falls Blvd.) and Riverside, traveled south on Washington Street to Sixth Avenue, where it turned west to a rock-cut on Bernard Street between Seventh and Eighth. From there it proceeded to a point where the Rockwood gate posts now stand. It then continued west on Sumner to the site of the present St. John’s Cathedral, then south on Grand to Montrose (Manito) Park, where the original line ended at about 19th. The Trial Trip Yesterday – A Full Description of the Comfortable Jaunt – In Perspective. “All Aboard!” shouted Conductor Peebles yesterday, and as the guests stepped off, the engine gave a tug and the long-delayed trip on the motor line was fairly under way. For several weeks the streetcar line has been waiting for the Northern Pacific’s permission to tunnel under the tracks at the Washington street crossing. At last, however, the city road, and Mr. Cook decided to operate his line at once as far as it is already completed. He issued a number of invitations for the trip and among those who accepted them were: Mayor Hoover and wife; Councilmen Water, Johnson and Fatheringham; J. J. White. Clerk; Chief Warren; City Attorney Houghton; and the representatives of the press. The heavy haul of so many passengers up the steep grade along the four blocks on Washington street severely tested the power of the motor; but after a sharp struggle she mounted the hill and turned her face to the East. The engine that drew the first car over the line is a very powerful one of forty-horse power with six drive wheels, which are good at holding or propelling. The line runs from there to Stevens street, and after winding in and out for some distance, enters a deep rock cut about 200 feet long. Emerging from this cut the road traverses the side of a high bluff, from which a grand view of the city is obtainable. Ascending another grade we reached the switchback and mounted to the summit of the hill [the site of the present Cathedral of St. John]. From there the road continues on for one mile through Montrose Park and other additions to our city. The land there is level prairie with the best of soil instead of the gravel upon which the city proper is built, and the residences [residential] property in that neighborhood will now become quite as attractive as that in any other part of town. When the end of the line was reached the guests stepped out of the car and were engaged for some time looking at the scenery; and they would have probably kept on gazing until nightfall if the whistle had not warned them to get aboard for the return trip, which was made in very quick time. As they stepped off the car at Second street the passengers, with one accord, thanked Mr. Cook for his courtesy and the ride, and sauntered to their respective homes. 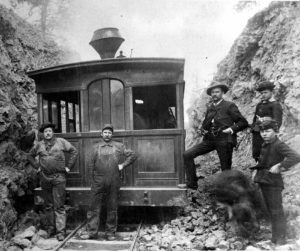 The crew of the train were: Conductor, Cad Peebles; engineer, Frank Goodrich; fireman, John Krick. The regular schedule will be in operation tomorrow. 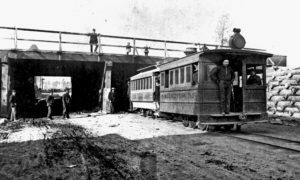 The line will be run with a transfer at the Washington street crossing to one of the company’s cars which will be pulled by horses to the Front street end of the road [the Washington Street viaduct was not completed when the streetcar began operating]. Cook’s original Spokane & Montrose Motor Railroad, circa 1889, on Washington Street, just south of Spokane’s first viaduct, which provided passage under the Northern Pacific Railroad tracks. When the line began operations in 1888, the viaduct was not yet completed, so early trips began near this point. Photo courtesy of the Northwest Museum of Arts and Culture, E. E. Bertrand collection (L86-1040). It was the hardest working line Spokane ever operated. The engine was operated by an engineer and fireman and the two passenger coaches were in charge of a conductor. Peter Mertz, former chief of police, was its first conductor. In leaving the top of the hill, the train went down nose first but on the return trip, the two coaches were backed up. During the winter in some of the heavy snows, Mr. Mertz states that it took the crew all day to get the little train down and back in one trip. The tram had no schedule and ran whenever it could negotiate its trips. It had a loud whistle and its engine sent forth such a flood of sparks that anybody could spot its whereabouts on the line. And many of its passenger carried souvenir holes in their clothing burned by the sparks. A tale is told of a lady passenger who rode frequently on the train in the “rush” hours of the morning. If a passenger didn’t manage to get a seat inside and was obliged to stand on the platform, he or she spent their time fighting off the sparks. This is what happened to the lady. Disembarking at Riverside, she entered a department store and was making a purchase when she smelled smoke and suggested to the clerk that the store must be on fire. He sniffed and smelled the smoke also and was about to put in a fire alarm when he saw that the smoke was rising from the top of the lady’s hat. It was one of the little tram’s sparks that had snuggled in the beflowered crown and after smoldering for a time was sending up little fumes of curling smoke. Mr. Mertz admitted the other day that lots of people were afraid to ride the tram because its cars ran off the track frequently … Riding the tram was Sunday’s amusement venture in Spokane and according to Mr. Mertz, he used to collect as much as $50 a Sunday. The fare was 10 cents. His salary was $1.00 a day, “And I was glad to get it,” Mr. Mertz reminisced. Old-timers recall that it was a dull day that the tram didn’t instigate a runaway. The puffing, spouting engine with its rain of sparks was the last thing a horse wanted to see. 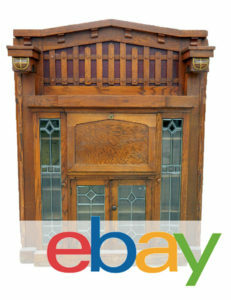 In 1892, Cook converted the little wood-burning trolley to electricity, which he purchased from Washington Water Power. It continued to shuttle people to and from his Montrose Park building sites, but there was little profit for Cook. He struggled to sell the building sites and meet his expenses. There were only a few dirt roads and no water service. Consequently, the new Montrose Park area remained mostly undeveloped. Mirror Lake and the pavilion, likely built at the time of Spokane’s first fair in 1886, were the main attractions. With the expectation of a promising future, the Cooks borrowed $40,000 on a three-year promissory note from Northwestern and Pacific Hypotheekbank on July 19, 1892. As collateral for the note, the Cooks offered 460 acres of land, including the area on which most of Manito Park and Manito Boulevard lies today, extending from about 17th to 37th avenues. No doubt this note helped to finance further residential development and the construction of the Cook’s beautiful home, with its lofty view of the city and Mt. Spokane in the distance. This nine-bedroom home, completed in 1892, was the first residence of such magnitude on the Manito plateau. 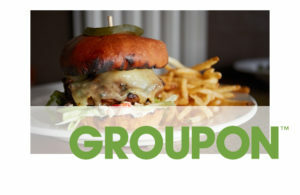 Unfortunately, the Cooks could not foresee the economic panic that hit the nation the following year, resulting in the worst depression since the 1870s. 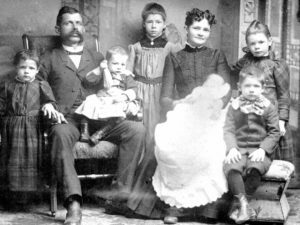 Francis and Laura Cook with their children, circa 1890s. Photo courtesy of Tony and Suzanne Bamonte. On June 27, 1893, silver hit an all-time low of 77 cents per ounce. With the resulting shutdown of many mines throughout the country and a collapse of the stock market, the nation entered into a four-year depression. Many of Spokane’s wealthy tycoons lost their fortunes. Cook suffered the loss of his Spokane & Montrose streetcar company. He also lost the land offered as collateral on the $40,000 note in a sheriff’s sale in 1895 (Superior Court case #8425). Most of Cook’s dreams for the future development of the Montrose/Manito neighborhood and park were swallowed up with the loss of the land. However, records indicate the Cooks made every effort to retain possession of their elegant home by selling much of their adjacent property. Sadly, their efforts failed. In July of 1897, the house was lost to the Provident Trust Company in another sheriff’s sale. The Montrose Park Addition’s thriving future was not to materialize until almost a decade later. By this time, Cook was well into other endeavors. Francis Cook was 42 years old when the Panic of 1893 hit. During his lifetime, he was dogged in his efforts to achieve success. Laura Cook later wrote of her husband, “The greater the task, the more it seemed to appeal to Mr. Cook.” His accomplishments were a better measure of his successes than his financial struggles would reflect. Although bringing life to the future Manito Park and surrounding area is perhaps his most popular legacy, it would not be Cook’s only accomplishment.